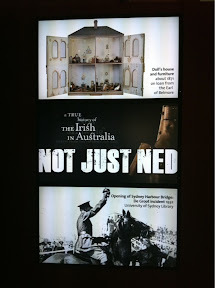 Today I visited the excellent Not Just Ned exhibition at the National Museum of Australia. •The video "Live at the Quiet Man" traditional music & dance. •All the Kelly gang armour together. I also liked the Ancestors of Jeff & Karen Toohey printed family tree with the use of colour to show born overseas (with small flag of country) or Australian born. So definitely worth a visit. The Irish seem to feature in every part of Australian life!! While you're there it's also worth checking out the other exhibits as well. Thanks Alison for posting this review of the Not Just Ned exhibition. I've been thinking of perhaps taking a trip to Canberra to see the exhibition and see the National Museum too as I have never been there. It would be great to include some research at the National Library as well!